Did you know that most Moen faucets come with a limited lifetime warranty, and the manufacturer sends you the right replacement parts for free? 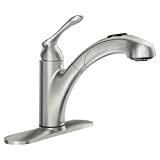 In the following article, we present the best Moen kitchen faucet reviews. Not all Moen faucets are the same, so it would be better for you to read our short reviews before you decide on buying a model. When you choose Moen, you can be certain of one thing. You will benefit from their top notch customer service. When you’re buying Moen, it’s certain that you’re buying high-quality products, and this high-arc faucet makes no exception. This kitchen faucet comes with a lotion/soap dispenser with an identical finish, and it’s suitable for every type of application from one to four holes. 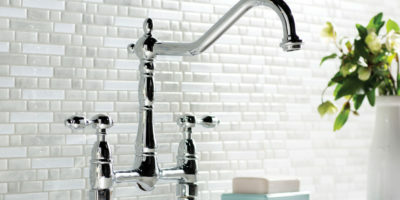 The faucet comes with a spot resist finish that’s very easy to clean and maintain. The finish will look as good as new even after you use it for a time. All the water spots and fingerprints on its surface are hard to detect, so with only a minimal maintenance, you will be able to keep it clean for a long time. This faucet should make a great addition to every kitchen that has a traditional design. The soap dispenser is helpful, and it looks nice next to the faucet. Deck Plate Included – The faucet comes with a deck plate, so you won’t have to spend any money for one. You will need a deck plate to hide the holes you didn’t use in the sink. Handle Is A Weak Point – The faucet’s handle is a weak point and it might break rather quickly. Some customers complained theirs broke after only a few years of use. Conclusion: This is a great pull-down faucet that comes at a reasonable price. You should be careful not to bump the handle when you’re cleaning dishes as it can be a weak point in the faucet’s construction. 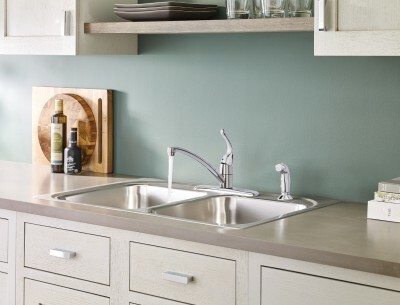 The Moen Banbury is a pullout faucet designed to fit in both traditional and modern kitchens. The faucet mixes a traditional design with sleek smooth lines, so it will make a great addition to every kitchen. The faucet’s pull out design will help you with cleaning pots, trays, and pans, and the spot resist finish will help with keeping the faucet looking as good as new for a long time without actually cleaning it. This faucet is suitable for all types of kitchens, but the pullout design means it will look better on large sinks. If you don’t have a large sink, you might be better off buying the Moen 7425 Chateau instead. 2 Streams – This faucet produces 2 water streams. The first one is aerated and it’s better for everyday use. The second one is narrower and it’s better at cleaning tough stains. No Base Plate – This faucet doesn’t come with a base plate so you might have some difficulties covering up the installation holes in your sink if you have more than one. 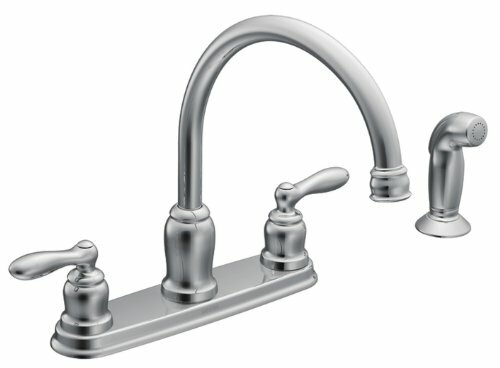 Conclusion: The Moen Banbury is a good faucet that’s great for both modern and traditional kitchens. However, the long neck makes it more suitable for large sinks. This Moen faucet is part of the Caldwell collection, and it has a traditional design. The faucet is suitable for a 4-hole application, and it comes with a side spray that has the same finish. The faucet has a chromed finish that’s very shiny. In fact, the faucet is reflective and it will look like a mirror. This makes the faucet easier to fit in a kitchen without modifying its design, but it makes it harder to keep clean. Easy Installation – This faucet is easy to install, and most people will be able to install it themselves. Color Caps Don’t Fit Properly – The color caps that indicate which tap produces hot or cold water sometimes don’t fit properly. You can cut come of the plastic off and use adhesive to keep them in place. The Moen Chateau comes with a mirror-like chromed finish that will look good in most kitchens, no matter their design. The faucet’s standard design makes it suitable for both sink and countertop mounts. This faucet uses an aerated stream that’s powerful enough for all your everyday tasks. The low arc neck makes the faucet good for both shallow and deep sinks. 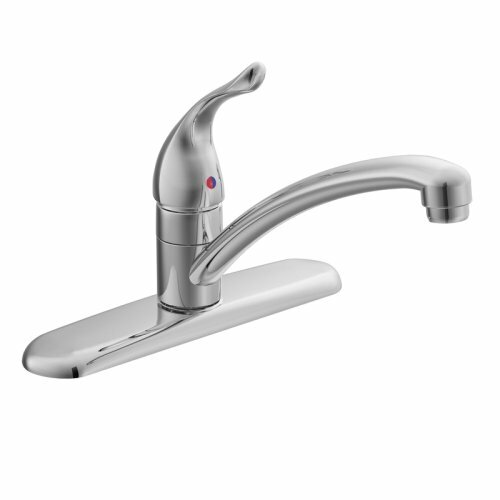 The single lever handle will help you adjust the water’s temperature. The Moen Chateau faucet has a low arc neck and a simple design. The faucet will look good in most kitchens, but keeping the faucet looking good requires frequent cleaning. Simple Design – This faucet has a simple yet efficient design. You can adjust the water temperature with ease, and the aerated spray is powerful. Not Eye-Catching – This is a good faucet, but it’s not an attractive one. It surely won’t attract attention unless it breaks. Moen is a company that exists since 1937. The company founder, Al Moen, was inspired to come up with a solution to the unpleasant experiences of faucets at that time could provide. It wasn’t rare for a person to be scalded by bursts of hot water when they were using a faucet, so Al Moen designed the first single-lever faucet. These new faucets were welcomed by the general public, and they started mass manufacturing them after the Second World War. In 1979, the company yet again revolutionized the faucet industry by introducing the washer free cartridge. The cartridge was used to redesign how tow-handle faucets worked. In 1982, Al Moen retired after an activity of over 45 years in the plumbing industry. His activity was rewarded by over 75 patents he developed over the years. One of the best things about buying a Moen product is that you can be sure new technologies were used in its construction. The company is world-renowned for implementing the latest technologies available in their products. Another advantage of choosing Moen is their excellent customer service. Moen kitchen faucet warranty is usually a limited lifetime one, so if you notice something is off with one of their products, you can contact them for a replacement. Moen faucet replacement parts are easy to find, so even if your model is not covered by the warranty any longer, you will still find them at your local store. 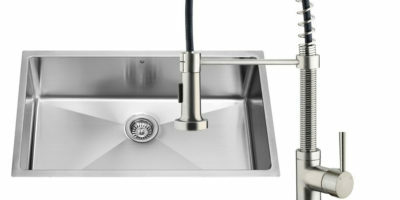 Also, check out our list of the absolute best touchless kitchen faucets and commercial faucet reviews here! Moen is one of the largest faucet manufacturers in the world, and they are world-renowned for the quality of their products. When you buy Moen, you’re sure to buy a long-lasting product. We’re certain that after taking a look at the Moen kitchen faucet reviews we prepared, you are now able to choose the best faucet model for your home. When it comes to top rated kitchen faucets, you don’t just have to choose an efficient one. You also need to choose one that goes well with your other appliances and fixtures you have in your kitchen. 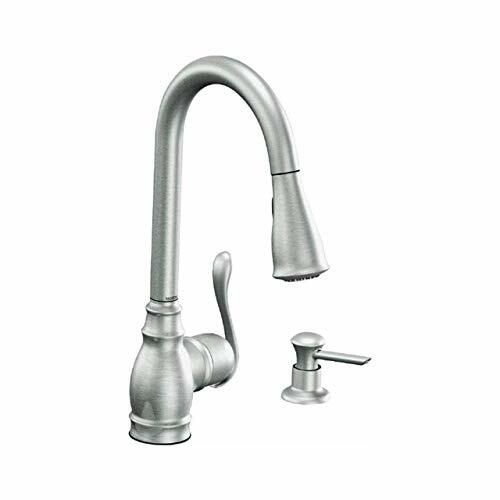 If you read our reviews and you’re still not certain Moen is the right manufacturer for you, check out the other manufacturers that produce awesome kitchen faucets like Waterstone and Pfister by clicking here.